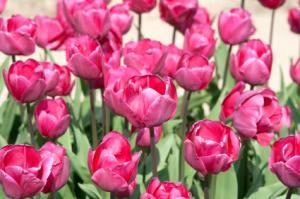 Tulips are a favorite springtime flower for many gardeners. Knowing when to plant the bulbs in your particular growing climate is a key element for a beautiful bloom each spring. There are two types of flower bulbs, tender and hardy. Tulip bulbs are considered hardy, meaning they require a period of cold weather in order to properly break their dormancy and resume growth. 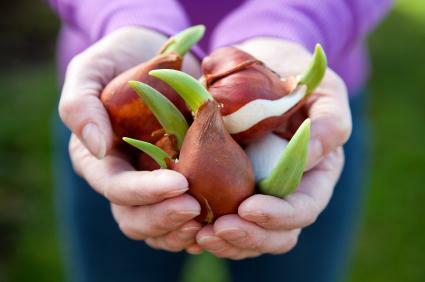 Tender bulbs are unable to tolerate cold weather and must be stored indoors until warmer temperatures resume. Hardy bulbs such as tulips can be left in the ground during the winter months or planted in the fall in cool to cold climate growing zones one to seven. The USDA Hardiness Growing Zone map for North America has 11 different growing zones. Growing zones higher than a seven will most likely require hardy bulbs to be stored in a refrigerator for the appropriate number of weeks needed until they can be planted to resume their natural growing cycle. According to Cleveland.com, the 2012 update of hardiness zones puts Ohio in growing zones 6B, 6A, and 5B. Expert gardener P. Allen Smith, who hosts his own gardening show on public television, suggests the best time for planting tulip bulbs in the moderate climate zones of four through seven (where Ohio falls) is any time from September through November. 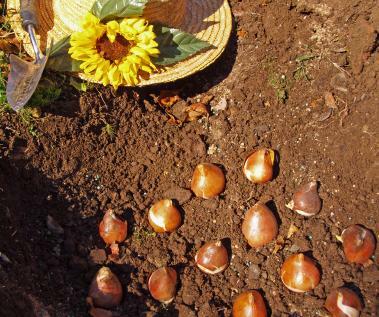 The bulbs should be planted soon after being purchased in order for a strong root system to develop before the winter frost arrives. Proper planting techniques for tulip bulbs are another key element for a successful spring bloom. Use the following tips to make sure your bulbs have the best chance of flowering. Large, firm bulbs are the best, although they will vary in size naturally. Dig an area instead of individual holes. Plant the bulbs at a depth that is at least three times their height. Instead of individual holes, dig out an entire area, deep enough for the largest bulb. Make small mounds for the smaller bulbs, to ensure all are planted at the proper depth. Always plant the bulbs with the fat end down and the tapered end up. If you find a bulb that you can't tell the fat end from the tapered end, plant it sideways. Plant the bulbs randomly instead of in straight rows. This will help you avoid having a hole in the row if a bulb fails to grow and also has a more natural appearance. Choose an area with plenty of sun exposure. Partial shade will also work, however the bulbs planted in areas with full sun exposure will grow faster and bloom first. Top off the soil with mulch, which should be factored in to the planting depth. Don't forget to water the area where you plant your bulbs. P. Allen Smith suggests using a piece of chicken wire cut one inch larger than the tulip bed. Bend the edges down to form a lid shape and place the chicken wire over the bulbs once they are covered with soil, pushing the edges into the soil. Then cover with mulch. Remove the chicken wire in the spring when the plant foliage begins to emerge. Smith also suggests using synthetic bulb food instead of bone meal when planting, as rodents are attracted to bone meal. Hardware cloth can also be laid over the planting area before covering with soil. Dip the bulbs in a rodent repellent such as Bobbex-R. Although there is about a three month span of planting time in the fall for tulip bulbs in Ohio, you should pay attention to weather patterns each year and adjust your planting time accordingly. If it has been an unusually cool summer or weather experts are predicting an early frost, plant your bulbs in early to mid- September.